Home > Janome Sewing Machine Co., Ltd.
Found 2 file extension associations related to Janome Customizer 11000 and 1 file format developed specifically for use with Janome Customizer 11000. Developer: Janome Sewing Machine Co., Ltd.
Customizer 11000 is a versatile, easy- to-use software package that has been designed to help you get the very best from your Memory Craft embroidery machine. It's easy to learn, fun to use, and the results will simply amaze you!With Customizer 11000 you can create your own unique masterpieces by importing designs from bitmap images or readily available clipart. Simply select your chosen hoop, import your image, and "click" to automatically convert it to an embroidery format, ready to dwnload and stitch out on your Memory Craft. You can add running or satin stitch outlines, or incorporate one of the five patterned fills into your design, including cross stitch, satin stitch, and various weave stitches. You can even create cutwork and applique'. Editing and personalizing designs is easy with Customizer 11000. Combine designs from cards, disks, or your own creations, and rearrange, rotate or change the original size. Ten font styles are included in the program to add fun text or create stylish monograms. 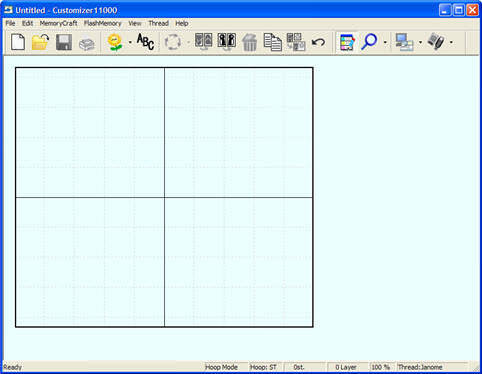 The automatic layout feature makes it easy to mirror designs and add borders. You can use templates for perfect matching. . When you use the Janome Clothsetter, you can design and stitch out embroidery as large as 9 sheets of 8 1/2" x 11" paper. Customizer 11000 makes it easy to design even large sized embroidery. Simply import designs or use those created in other parts of the program. Then manipulate them on screen to get the best placement. The finished design can be stitched out on your Memory Craft without needing to rehoop, and the program will ensure designs are correctly positioned every time. Embroidery File Formats Janome formats: .JEF, .SEW. If you need more information please contact the developers of Janome Customizer 11000 (Janome Sewing Machine Co., Ltd.), or check out their product website.